Veep second season review: HBO’s much-improved political satire starring Julia Louis-Dreyfus. 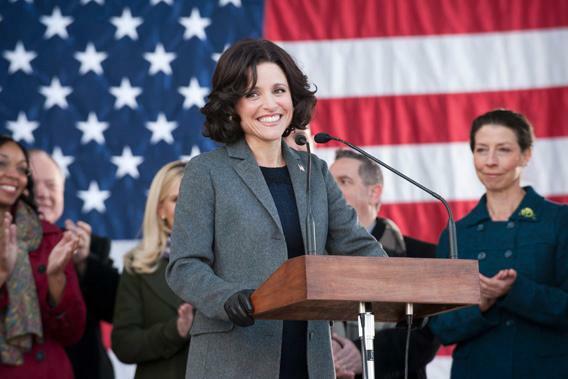 Selina Meyer’s a player in the second season of Veep, and the show is much better as a result. Last year, in every episode of Veep (HBO, Sundays at 10 p.m. ET), Vice President Selina Meyer (Julia Louis-Dreyfus) delivered the saddest catchphrase on TV. She’d return to her office or seek solace after a photo op was waylaid by gaffes, and she’d ask a secretary: “Did the president call?” He never called. That was the joke. It was the final injury piled upon insults, like watching Tom get bested by Jerry for 30 minutes, then learning he has gout. Meyer was simply too pathetic in that first season. That might be the reason House of Cards, the Netflix series released this winter, became Washington’s political-satire-inspired-by-a-British-satire of choice. It wasn’t smarter than Veep, but its characters were allowed to win sometimes. Francis Underwood snuck all manner of crimes past a compliant media, and we loved him for it. (He actually got away with less than his British counterpart, who managed constantly, untraceably to murder people who combed his secrets.) Selina Meyer couldn’t even fake-cry on camera without the scheme getting leaked. Suddenly the White House almost needs her. She has access to the White House chief of staff, played as a loser by Kevin Dunn—the dad from the Transformers trilogy, somehow even less authoritative here. “We all know the White House would work so much better if there wasn’t a president,” he tells Meyer. “But there is, and we have to work around that.” Her prize for having, as the callow new adviser played by Gary Cole notes, “traction with the swing voters”: an actual role in the administration, in foreign policy. And happily for Veep, that means she gets to commit higher-quality mishaps. Veep creator Armando Iannucci got an Oscar nomination for In the Loop, his farce about the start of an Iraq–like war, which wrenched jokes out of a conflict that would kill tens of thousands of people. The higher the stakes, the funnier it was. Meyer’s expanded foreign-policy brief gets her Situation Room access and planning roles in military missions. When Meyer meets her daughter’s new boyfriend, an Iranian-American, the vice president can only think about the next rung. Louis-Dreyfus pulls this off with some excellent mugging and awkward conversation—“Oh, you speak Farsi?”—before telling an aide to vet the boy and his family. She’s not pathetic anymore, and a darker farce is a funnier farce. I enjoyed the first run of Veep and didn’t particularly mind its departures from the real D.C. But Meyer’s new seriousness does wonders for the comedy. Maybe it’s playing catch-up. When Veep was pitched, America was in the last throes of its fascination with Sarah Palin. The real veep, Joe Biden, was a late-night joke whose most-watched accomplishment was out-debating Palin; the average debate-watcher probably thought he could do the same from his couch. But our vice president has won two elections now, he too has an expanded foreign-policy brief, and either he or Hillary Clinton has the advantage for the next Democratic nomination. It’s unexpected and compelling. So is Veep.